Hillel Neuer with a resolution declaring Sept. 15, 2016, to be Hillel Neuer Day. 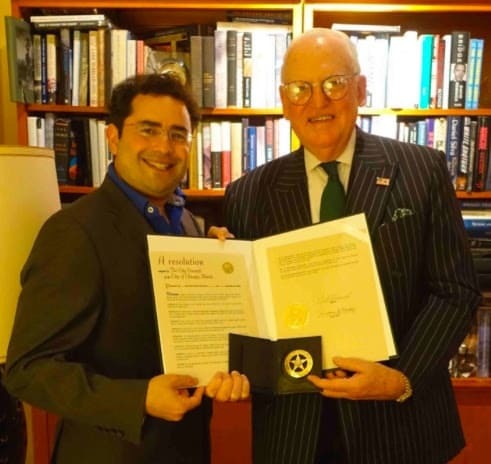 In honor of the visit by the executive director of UN Watch, the Chicago City Council adopted a resolution declaring today, September 15, 2016, to be Hillel Neuer Day, in recognition of his “contributions to promote peace, justice and human rights around the world.” Before an audience of 1,300 delegates, including diplomats and elected officials, Neuer delivered the keynote address today at the annual meeting of the Chicago Jewish Federation. BE IT FURTHER RESOLVED, That Thursday, September 15, 2016, shall be officially recognized as Hillel Neuer Day throughout the City of Chicago. GENEVA, Sept. 14, 2016 — As reported in the Jerusalem Post, UN rights chief Zeid Ra’ad al-Hussein accused Israel on Monday of acting like Iran, Syria and North Korea by having “a long record of refusing to cooperate” with UN Human Rights Council inquiries and investigative mandates. However, UN Watch took the floor to remind al-Hussein that in the recent past he too has boycotted UN debates that he believes are biased and illegitimate. In fact, noted UN Watch, Israel this week is hosting a UNHRC expert visit, and in the past has admitted more UN rights experts than almost any other country, as well as former UN rights chief Navi Pillay, both to Israel and the Palestinian territories. In the presence of ambassadors and the High Commissioner himself, UN Watch exposed al-Hussein’s additional double standards, such as referring only to Palestinian territories as “occupied,” and his relative silence on grave abuses in Venezuela. Full speech below. Statement delivered by UN Watch on report of the High Commissioner, Human Rights Council, 33rd Session, 14 September 2016.